musical forgeries, and jazz singing, as well as Goodman’s allographic/autographic distinction, Adorno’s critique of popular music, and what improvisation is and is not. The book is organized into three parts. Drawing on innovative strategies adopted to address challenges that arise for the project of defining art, Part I shows how historical definitions of art provide a blueprint for a historical definition of jazz. Part II extends the book’s commitment to social-historical contextualism by exploring distinctive ways that jazz has shaped, and been shaped by, American culture. It uses the lens of jazz vocals to provide perspective on racial issues previously unaddressed in the work. It then examines the broader premise that jazz was a socially progressive force in American popular culture. Part III concentrates on a topic that has entered into the arguments of each of the previous chapters: what is jazz improvisation? It outlines a pluralistic framework in which distinctive performance intentions distinguish distinctive kinds of jazz improvisation. 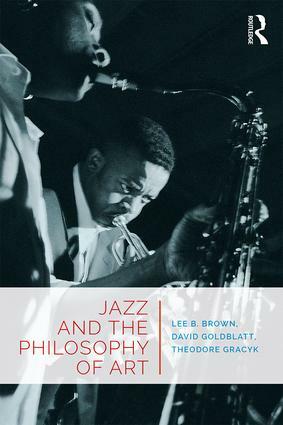 "Counteracting the regrettable tendency in anglophone aesthetics to treat jazz as an afterthought, this book devotes sustained attention to jazz in its evolving sociohistorical context. Brown, Goldblatt, and Gracyk defend a pluralistic account of jazz and the aesthetic intentions that shape it, stressing the music’s diversity and its complicated embeddedness in American racial politics. This book is a must-read not only for those concerned with musical aesthetics, but for anyone interested in the powerful contribution that jazz has made and continues to make in American life." 2 A Theory of Jazz Music: "It Don't Mean a Thing …"